Carmen W. McCarthy of Woburn, Friday August 31st, he was 86 years of age. Beloved husband of Barbara (DeMaeo) McCarthy. Devoted father of Karyn Gentile, her husband Paul, and Kevin McCarthy, all of Woburn. Dear brother of William McCarthy Jr. of Billerica and Carmen’s twin brother John McCarthy of Winthrop. Loving grandfather of Kevin McCarthy Jr, and Kaeleigh McCarthy. Great-grandfather of Frankie Hegarty McCarthy. A celebration of life service will take place on Saturday September 29th, Carmen’s 87th birthday, from noon to 4:00 p.m. at the American Legion Post 101, 194 Lexington St., Woburn with Military honors to take place at 1:30 p.m. Remembrances may be made in Carmen’s memory to: Friends of Woburn Veterans, 144 School St. Woburn, MA 01801, as well as Woburn Boys and Girls Club, 1 Charles Gardner Ln., Woburn, MA 01801. Remembrances may be made in Carmen’s memory to: Friends of Woburn Veterans, 144 School St. Woburn, Ma 01801 as well as Woburn Boys and Girls Club, 1 Charles Gardner Ln, Woburn, MA 01801. Carmen W. McCarthy, of Woburn, died peacefully at his home Friday August 31st, surrounded by his family. He was 86 years of age. He was the beloved husband of 63 years to Barbara (DeMeo) McCarthy. He was born in Chelsea and raised in East Boston. Son of the late William McCarthy Sr. and the late Mary (Capillo) McCarthy. Carmen was a graduate of Boston Technical High School. 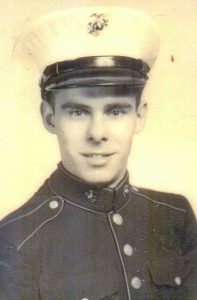 After high school, Carmen served his country proudly as a Corporal in the United States Marines Corp during the Korean War. He was proud to be an American, and extremely proud to have been a Marine. He received a Three Star Battle Medal, a National Defense Service Medal, a UN Service Medal, and the Korean Ambassador Peace Medal, which he received on September 7, 2017. Carmen had a 41 year work career at Hardware Products, where he was a machinist and always went above and beyond. He was loved by everyone he worked with. Carmen was one of the founding members of the Marine Corp League, a longtime Adjutant and Past Commander of the American Legion, Post 101 from 1978-1979. He was also a member of the VFW 543 Woburn. Carmen met his beloved bride Barbara at his twin brother John’s wedding. After sweeping her off her feet, they got married and first settled in East Boston until permanently settling in Woburn in 1966. Carmen was an avid sports fan, especially of the Boston Red Sox. He also loved animals and had his own “doggy day care” up until the time of his passing. Carmen was a unique, well-loved man with a great sense of humor. He will be deeply missed. Along with his wife Barbara, Carmen is survived by his children, Karyn Gentile and her husband Paul, and Kevin McCarthy Sr., both of Woburn. Dear brother of John McCarthy and his wife Althea of Winthrop, and William McCarthy Jr. of Lawrence. Loving grandfather of Kevin Jr. and Kaeleigh McCarthy. Great-grandfather of Frankie Hegarty McCarthy. A celebration of life service will take place on Saturday September 29th, Carmen’s 87th birthday, from noon to 4:00 p.m. at the American Legion Post 101, 194 Lexington St., Woburn with Military honors to take place at 1:30 p.m. Remembrances may be made in Carmen’s memory to: Friends of Woburn Veterans, 144 School St. Woburn, MA 01801, as well as Woburn Boys and Girls Club, 1 Charles Gardner Ln., Woburn, MA 01801. My thoughts and prayers for Carmen’s family and friends. You have many wonderful memories to cherish. Sending much love and strength. It was sad to hear about the passing of Carmen. Living in Florida for the last 13 years, the only time I would see Carmen was during the Christmas holidays. When my mother got ill earlier this year, I moved back to Woburn to be with her. Carmen was such a wonderful neighbor and friend to her. He offered his driveway so we could push her wheelchair around the backyard to avoid her taking the stairs for her Chemo session. And he would call me every few days to check in on her. And was one of the last few people we call to visit Mom in her dying days. From the first day my husband Nick went to work at Hardware Products he became friends with Carmen. That’s over fifty years ago. He repaired so many things for us. Our kids still remember the Hershey candy bars he would bring and the hockey tryouts he would go to. We will always remember him and his caring ways. Our sincerest sympathy to Barbara, Karyn, Kevin and family. Carmen was a kind, gentle, fun and sweet, thoughtful man with a quick wit and loaded with a sense of humor. Really a great and loyal friend to my father, Victor Cusolito, and a cheery smile to greet you and always took the time to sit and talk. He spent many, many hours keeping my father company, a man Carmen loved very much, and my father felt the same way about him. Praying for Barbara and his beloved family, and praying he and my parents are seeing each other in heaven now. Carmen was on-of-a-kind. A blessing to all around him and a joy for all who knew him. I am sorry for your loss. Although we hadn’t seen each other in years, he would email often. We go back to the Hardware Product days. He made life there bearable. I will miss Carmen and his great sense of humor. Kevin sorry for your loss. Carmen was a great man. Always greeted me with a smile. May he Rest In Peace. My heart is with all of you. Carmen was a wonderful man. I have so many memories of him. Especially bringing the dogs over to see him in their Halloween costumes. May he rest in Peace. All my love. The ones we love are never gone but live within our hearts. May you know peace and comfort.